Edward Joseph Snowden was born on 21 June 1983 in the city of Elizabeth, North Carolina. On 11 September 2001 he’s only eighteen years old, and like his peers he watched the collapse of the Twin Towers and the attack on the Pentagon live on the Internet. Shortly thereafter, Edward begins to study computer sciences; he won’t finish them, but it’s not much of a problem because he’s part of the digital generation that is “ready” for the long awaited change in the United States. After all, formal education couldn’t keep up with the fast paced developments in the fields driving the change, and it was far better to simply learn by doing. At that time, there wasn’t a single American who wasn’t convinced of the approaching Information Revolution and that this doctrine would then go on to Evangelize the world. And so it happened that – before the speculation bubble in the IT sector burst and the ensuing the stock market crash between 2000 and 2001 – even the Central Intelligence Agency (CIA) had seen IT as a strategic lever for US Intelligence, and began to move toward a change that would decisively and drastically transform HUMINT and increase the resources available to SIGINT. After all, the Soviet block no longer represented a danger; the Cold War had come to an end; and the threat on American soil posed by the matrix of international terrorism had not yet been detected. This strategic evolution, in a “digital” sense, of the CIA also mirrored the interests of the American private sector and was favoured by Congress and the government. It was for this reason that many functionaries over forty were replaced by the new digital recruits, all of whom were little more than twenty years old. When all’s said and done, this digital revolution was the air that that part of the West breathed, and the Internet promised to change the world. In the CIA, then, the generational switchover – which was supposed to upgrade the Agency’s activities of Intelligence, and above all, reduce the expenditures in the budget of the United States of America – had begun. That said, it’s not surprising that a young, just-under-twenty Edward Snowden was recruited by the CIA to work on Information Security. This generational shift in the CIA, which took place just after the start of the new 21st century, however, effectively drained the CIA of its competence and Intelligence know-how; the generation that was being replaced had gone to work in the private sector, and the incoming generation of “digital” youths were not at all ready to fill their shoes, the moment that it takes years of work in the Agency to develop (refined) Intelligence skills (HUMINT). Perhaps even more so, are the necessary investments in HUMINT, which had instead been devolved to jump-start the processes of intercepting communications, data collection and digital espionage at the worldwide level, in other words, to launch and enhance SIGINT. Although it was not clear at the time, the CIA to all effects had become an empty box that was incapable of executing the task that it had been assigned: i.e. to collect the necessary information to find Bin-Laden and to eradicate Al-Qā’ida. 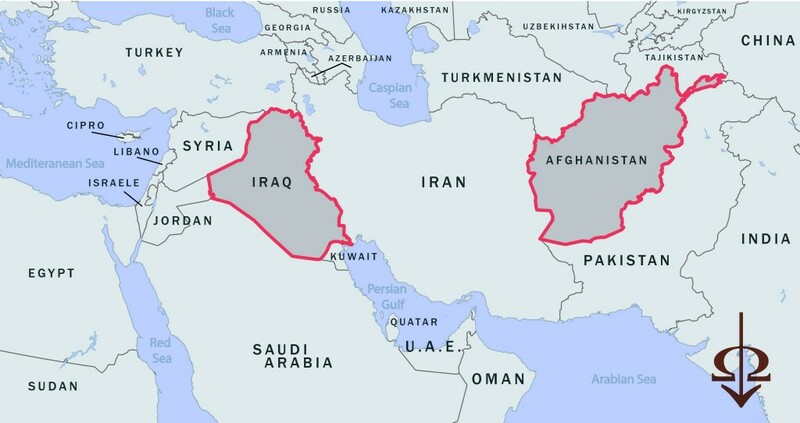 Given that the two wars that George W. Bush was so bent on having broke out during this transformation, this shift – both generational and technological – to embrace the digital era would also have dramatic repercussions on the outcomes of these wars, which were to follow not long after in Afghanistan (October 2001) and in Iraq (March 2003). These repercussions stemmed from two primary factors: the impossibility to adequately deploy American HUMINT, and the overestimation of the role Information Technology and SIGINT were supposed to play in the conflicts. The first resulted from the replacement of the old guard, which lead to a decrease in expertise, and the fact that the USA had been caught unawares of the terrorist risks from the Middle East – indeed, the CIA at the time did not hire American citizens whose parents were in the Middle East, and therefore there was no one in Intelligence that spoke Arabic, effectively compromising HUMINT intelligence-gathering in loco, as well as intelligence analysis. The second was born of a discrepancy between expectations and real capabilities. In Iraq, before the military operations had begun, the American cyber-warriors of the NSA had already penetrated the networks of the adversary’s defences (PTD – We Penetrate Targets’ Defences) gathering terabytes of data with the BULLRUN super-system that had been developed and refined by the NSA. The encrypted communications of the Iraqi Ministry of Defence were cracked in real time by the NSA’s super-system, and the information was rendered immediately available to cryptanalysts. In fact, the start to the hostilities on the battlefield in the 2nd Iraq war was preceded by an IT attack by American cyber-warriors, the objective of which was to terrorize the upper ranks of the Iraqi Ministry of Defence. The American cyber-warriors sent them emails in Arabic, forewarning the arrival of the apocalypse; they contained the name of the Iraqi official and the invitation to leave command once hostilities had begun if they wished to save their own skin. Television broadcasts contributed to spreading the fear, using images (to us familiar) of the “intelligent” missiles that were used in the first Gulf War. This was the Information Warfare of the United States. Once it had become clear however, that the strategy wasn’t working; in Baghdad, the war was being carried out door-to-door, and it was essential to know from HUMINT whether the soldiers had to knock on the door or throw a grenade into the house. The powerful American war machine found that it had to change strategies if it didn’t want to find itself locked into a catastrophic downward spiral. This change in direction, pushed by President George W. Bush, came with the new nominations for the heads in command. It is in this period, more specifically in August 2005, that General Keith B. Alexander is nominated Director of the National Security Agency. General Michael V. Hayden is nominated Director of the CIA in May 2006, but before that he was Vice-Director of National Intelligence. John Negroponte, Director of National Intelligence, becomes Vice-Secretary of the State Department in 2007. Again in 2007, Admiral John Michael McConnell comes out of retirement to accept the position of Director of National Intelligence, after having worked for Booz Allen Hamilton. All of the key positions in the CIA are by this point in the hands of Generals or ex-Generals, and, as Tim Weiner aptly noted, the Pentagon destroyed the CIA, by colonizing, to all effects, its upper ranks. But while the Bush administration was handing out promotions left and right, Iraq was turning into a complete disaster for the Central Intelligence Agency. Strong from George W. Bush’s politics, the Generals of the Pentagon inaugurate a new military strategy, which will be increasingly characterized by the ever expanding use of unmanned aerial vehicles – more commonly known as drones – a mix of digitization and dehumanization of the war in order to better give chase to the number one enemy of the USA: Bin Laden. It was within this context that Edward Snowden joins the Agency to partake in the digital push to extirpate the source of evil. As aforementioned, the NSA system collected metadata throughout the war. U.S. Air Force drones were used to intercept the bit streams of any communications that made use of GSM/GPRS or satellite radiofrequencies (also known as virtual base-tower transceivers), among which cellular phone activity. The extensive use of drones in the sky and of tactical GSM-OFF Air, enabled the information super-system to be populated with the necessary metadata for the real time geo-localization of any individual, terrorist or not, carrying a cellular phone. Behind every telephone number (SIM-CARD) was a name, and behind the name, a possible terrorist. The proximity analyses inferred that, even if there had been no calls between those numbers, the very fact that they had been in the near vicinity one with the other for a few moments and with a certain repetitiveness rendered it probable that the cell-phone holders were part of a group – perhaps supporters, perhaps dissidents, or even terrorists. If even one of these numbers came up positive (i.e., was registered to a terrorist), all of those neighbouring points in the network automatically became super-terrorists, whose lives were no longer worth anything and over which the CIA was given the license to kill. To all effects, these SIM-CARDs for cellular phones became digital footprints for SIGINT: trajectories of user information bits subjected to the analysis of the NSA’s super-systems, to eventually become targets to be struck down with the surgical precision that we all became familiar with through the news reports. But the response of the heads of the programme to brush off or ignore unexplainable data and unclear underlying reasons brought to light the self-referential characteristics of the system. Without reliable HUMINT to verify the SIGINT, other SIGINT was used to confirm the data. It became evident that no one was willing to recognize that such a costly system had bugs that needed to be worked out. After several years the war takes a turn for the worse. Three years of conflict are an eternity for the American troops even for the young men in the CIA – incapable of carrying out their duties because the digitization had not helped them to detect the true threats – who were themselves terrified of the dimensions that the conflict had begun to take on, and who went to ground in the Green Zone of Baghdad, careful not to leave these ultra-protected bases. By this point, they are viewed as an army of occupation. But in the fourth year, the troops and CIA agents are exhausted and it is around this time that the incompetence of the CIA truly takes on unreasonable, no longer sustainable dimensions. What had previously been a policy to reconfigure the Intelligence Bureau as well as cuts to contain its budget evolves further into an outsourcing of CIA activities to the private sphere. And even as it is decided to fall back on and increase the use of these digital technologies, the US Congress in 2005 and 2006 cut CIA spending. Doomsayers are not lacking amongst the US senators with regard to this passage from the public to the private sphere. But by then, the damage had already been done. The drones are now remote controlled by civilian employees in Florida who are seated in comfortable chairs in the air-conditioned rooms of the control centres of the unmanned aerial vehicles, which communicate with the drones through the Internet and satellite connections. Trained military personnel aren’t the ones sitting in the virtual cockpits guiding the drones, but rather average everyday employees at the service of private businesses and who are subject to bureaucratic control. Civilian drone pilots picked up where the CIA had left off. The irony of the sort was that Al-Zawahiri had, in a handbook, already issued a warning to his subversive cells not to use encrypted communications based on the standard encryption systems AES, and DES, since these were not considered secure systems. Al-Zawahiri gave his terrorist cells instructions to exclusively use mono-use block ciphers with the random generation of the decryption key, keys that were not to be generated by a computer and that were never to be communicated over the Internet. Therefore the Al-Qāʿida leader had promoted the use of a secure system (also difficult to use in practice); even in the event that they were intercepted, this system rendered messages indecipherable by cryptanalysts, as long as the rules were followed when creating the decryption keys: namely, the random creation of the key, the generation of a key as long as the message itself, safeguarding of the key, and using it only once. When the “intelligent” missiles began to rain down on Afghanistan, systematically striking down such specific targets with its drone system, it was not long before some in the enemy ranks figured out the American strategy. It was then that the Taliban imposed the shutdown of the GSM antennas in the villages for many hours a day. The terrorists also began to distribute the positive SIM-CARDS to random people who had nothing to do with the terrorists. Hence, the “hello bomb” was born: the phone would ring and a missile would lock on the target, striking the individuals carrying the red-flagged SIM-CARDs. Frequently, innocent civilians were killed in the strikes, including women and children. How could the U.S. persuade their Afghan partners that they were an Army of liberation? Furthermore, the ferocity of these targeted attacks had sparked a cycle of interminable violence, namely leading to the suicide attacks by Al-Qāʿida. It is here, that we come to Edward Snowden’s release of information that was published in an article by Jeremy Scahill and Glen Greenwald in The//Intercept on 10 February 2014. What comes to the fore, is an evident scene of degeneration and of interminable violence caused by the incursions of the U.S. Air Force, a deadly mix of National Security Agency (NSA) technologies, drones (an unmanned aerial vehicle) and “intelligent” missiles at the expense of the Afghan and Iraqi civilian populations. The war is responsible for the deaths of thousands of civilians and increases in the losses suffered amongst the American soldiers are a direct consequence of the fact that US Intelligence in Afghanistan and Iraq could not go operational. This scenario has been confirmed using the cables and videos published on WikiLeaks by Assange. The catastrophe of the Afghan and Iraq wars is written in history. The conflict in Afghanistan, since its beginning in October 2001, has caused the deaths of more than 10,000 men in the Afghan security forces, 3,423 fallen soldiers of the coalition under the aegis of NATO, of which 48 were Italian. The second war in Iraq, launched in March 2003, has caused 4,804 casualties among the soldiers of the coalition, of which 33 are Italian. Moreover, 1,313 contractors of various nationalities were killed during the wars in Afghanistan and Iraq. Of the more than 1.5 million soldiers that were stationed in Iraq and Afghanistan since the start of the wars, 32,000 were wounded, many of which have suffered serious, permanently disabling physical injuries. In the American hospitals, more than 270,000 cases of post-traumatic stress disorder have since been diagnosed in the veterans of the Afghan and Iraq wars. 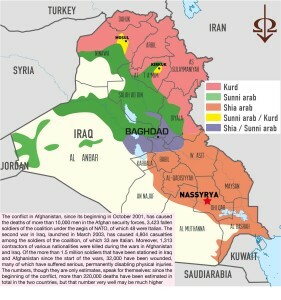 And although the forces of the coalition pulled out of Iraq on 18 December 2011, the war continues to have dramatic repercussions on the lives of these peoples. The second war in Iraq alone, so desired by President George W. Bush, has dragged the Iraqi nation down into a spiral of violence caused by fierce contrasting internal positions and the objectives of Al-Qāʿida’s terrorist groups, which has, in turn, given rise to the outbreak of the civil war that continues to rage on. Still today, the civilians are those who must pay the costs. The numbers, though they are only estimates, speak for themselves: since the beginning of the conflict, more than 220,000 deaths have been estimated in total in the two countries, but that number very well may be much higher. But not everyone in the security sphere has remained silent with regard to the mismanagement of these last ten years or so. Former CIA Director and former Secretary of Defence, Robert M. Gates writes in his book, Duty, that the Bush administration during the wars was a “toxic mix of flawed assumptions about the wars themselves; a risk-averse bureaucracy; budgetary decisions made in isolation from the battlefield; Army, Navy and Air Force focus in Washington on the routine budget process and protecting dollars for future programs; a White House unaware of the needs of the troops and disinclined to pay much attention to the handful of members of Congress who pointed to those needs; and a Congress by and large so focused on the politics of the war in Iraq that it was asleep at the switch or simply too pusillanimous when it came to the needs of the troops.” Gates in 2011, under the Obama administration, stepped down from his position. So, where does the young thirty-something, Edward Joseph Snowden want to take us with his revelations, if even the true enemies of the United States of America in Afghanistan and Iraq had already worked out during the conflict how the system used by the CIA for its interceptions worked and guaranteeing its failure on the battlefield? Whatever the reason, be it to inform the people of what has truly happened and is happening, or of other less clear motives, what hasn’t changed are the lives that were taken, destroyed and permanently altered by these wars. Maps by Vincenzo Adriano Cirillo and Guido Cormino. The translation of the text was carried out by Margot J. Wylie. Weiner, Tim. Legacy of Ashes: The History of the CIA. Anchor Books, New York. 2007. Fisk, Robert. The Great War for Civilization: the Conquest of the Middle East. Fourth Estate, London, 2005. Gates, Robert M. Duty: Memoirs of a Secretary at War. Ed. W.H.Allen, 2014. 1 HUMINT (HUMan INTelligence): a category of intelligence that is based on the information gathered and provided by human sources. 2 SIGINT (SIGnals INTelligence): Intelligence-gathering through the interception of signals. This acronym is an excerpt from one of the first slides leaked by Snowden. Weiner, Tim. CIA. Rizzoli, November 2008, p 474. (English Ed. Legacy of Ashes: The History of the CIA. Anchor Books, New York, 2007.) This is a reference to Robert M. Gates, who from Chief at the Pentagon became Secretary of Defence in 2006. Here are two websites that lead to organizations and sources that have counted and reported on the numbers of the fallen and the casualties: http://icasualties.org/ (last visited 2.3.2014); this last compiles a list of reports of the deaths of private contractors and their sources: http://en.wikipedia.org/wiki/List_of_private_contractor_deaths_in_Afghanistan (last visited 2.3.2014).